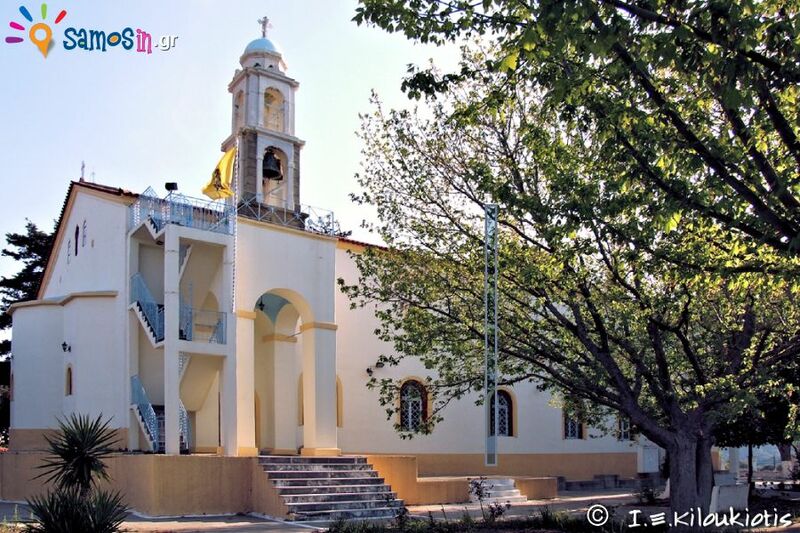 At the top of the hill, at the highest point of Lekka village in Samos, is located the parish church of St. John the Baptist, the temple dedicated to the decapitation of St.John the Baptist’s and celebrates on August 29th. 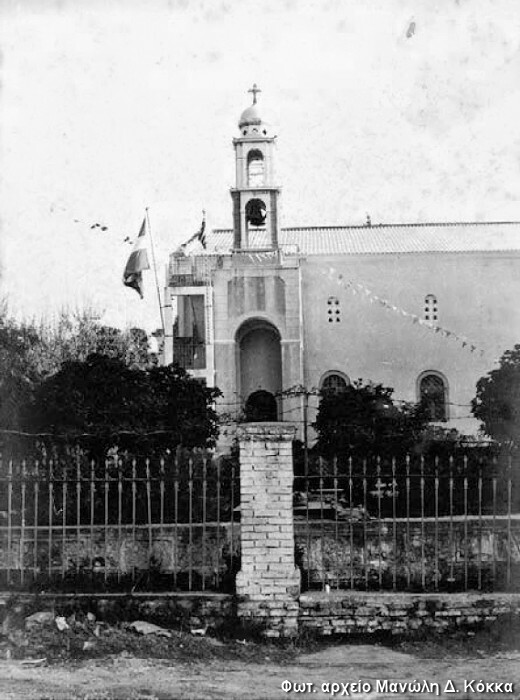 The previous parish church of the village (until 1863) was dedicated to Agios Dimitrios and was located next to the square of the village, above the fountain. But the unstable of the soil and the damage that caused the frequent subsidence to the temple, forced the inhabitants to build a newer temple in another safer place. The suggestions was many, as well the reactions to the erection of the new church, until, according to the tradition of the village, a villager argued that he saw in his dream, Saint John, indicating the place for the erection of the church, and so were persuaded, and the most skeptical, about the erection of the temple in today’s place. 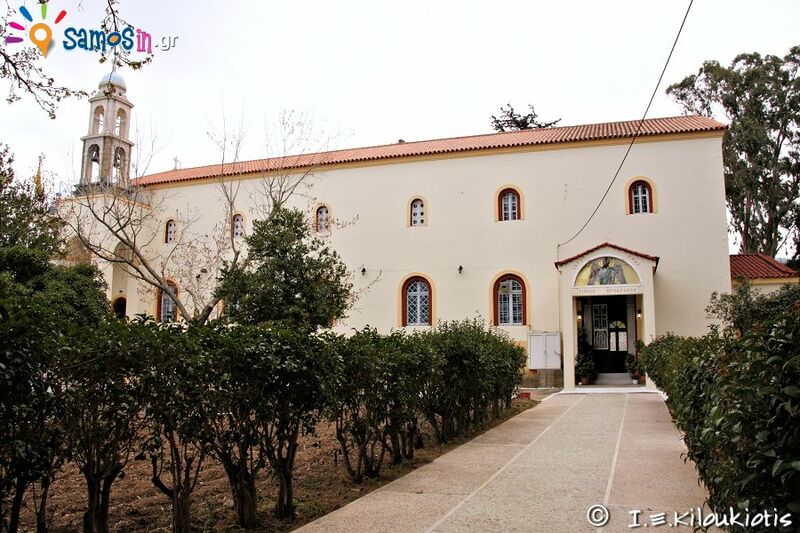 The temple probably began to be built around 1845, with significant financial aid from expatriate, and volunteer work of the village residents, whom they invited every Sunday to work for the temple. The craftsmen were free to take building materials (stones, woods, etc.) for the erection of the church from all over the village area, without having to seek permission from the owner of the field. 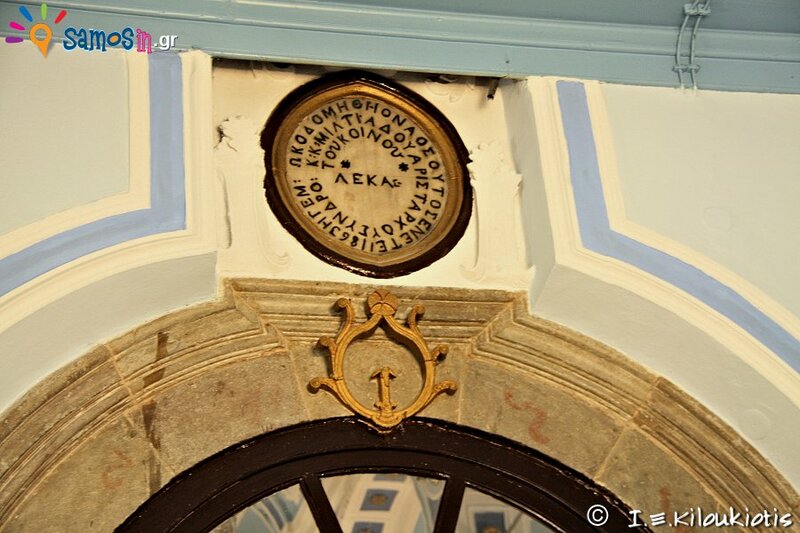 According a receipts, that exists at General State Archives of Samos, in 1848, the Mayor, Petros Tzakonas, received the first financial support of the Hegemony, amounting to 300 liras, for the erection of the church, as decided by the 16th general assembly of Samos Hegemony Parliament. 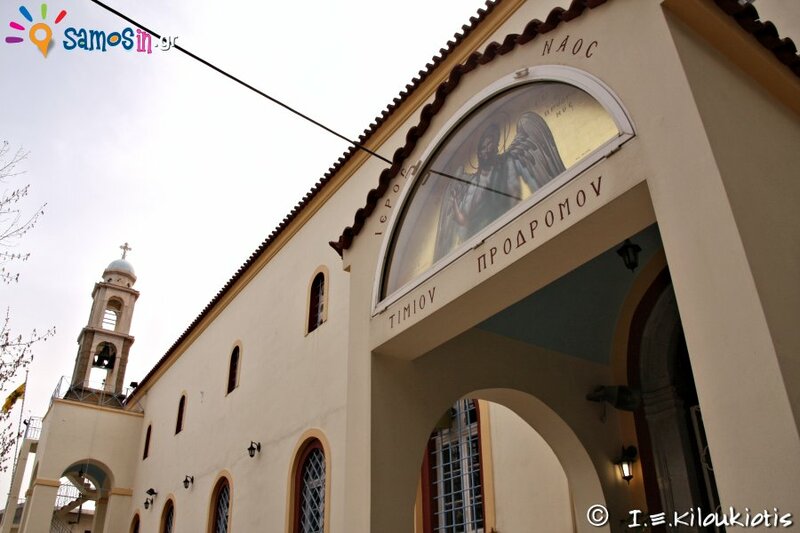 The church is completed in 1863, under the ruler Miltiades Aristarchos, as the inscription above the entry of the narthex indicates. 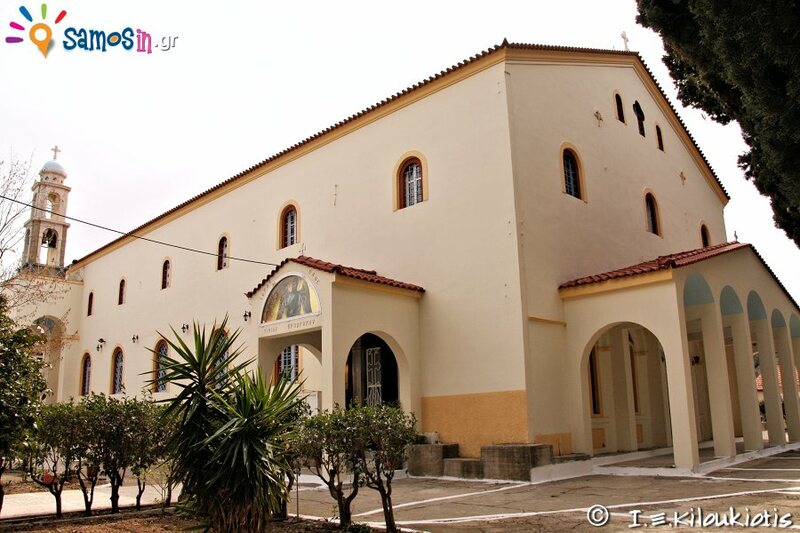 The church is built in the basilica style, with two-sided tiled roof without a dome, elongated (rectangular), divided internally, with pillars, in 3 aisles. The aisle at the middle is the main church of St.John the Baptist’s, the northern aisle dedicated to Saint Demetrius, perhaps to remember their old church, while the southern aisle is dedicated to the Saint Taxiarches (Archangels Michael & Gabriel), which probably was a church in the former settlement of “Morias” (close to the south of Lekka), which due to landslides was abandoned by its inhabitants and moved to the village of Lekka in the middle of the 18th century. 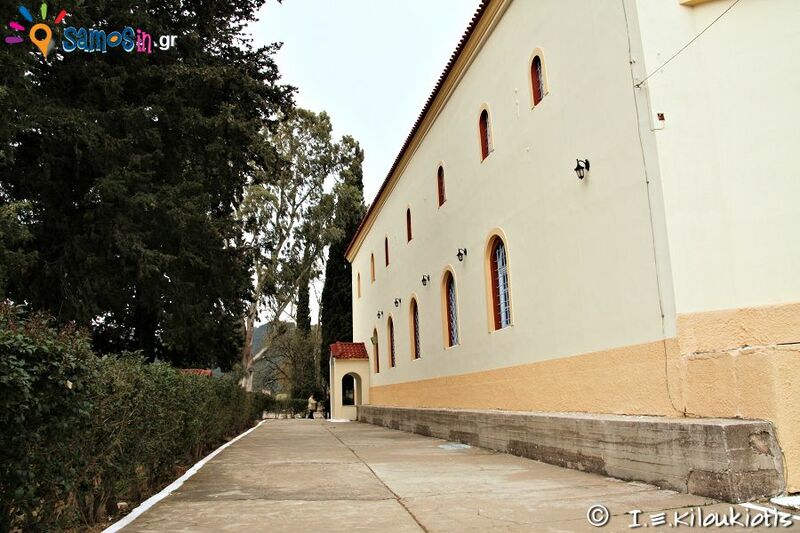 The size of the church is 36 meters long and 16 meters wide, while the sheltered space is 600 sq.m. about. The roof of the temple is made of wild cypresses and pine trees that come from the area of ​​Tsourlei, near Lekka. 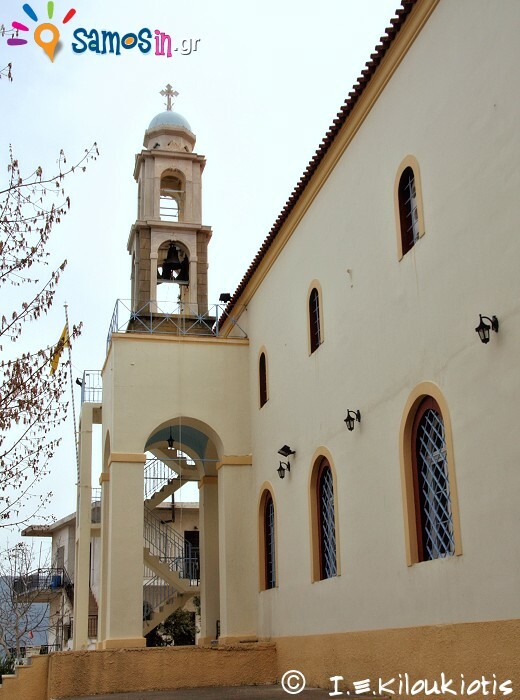 The ornate marble bell tower of the temple has no inscriptions, but it is most likely to be constructed at marble sculpture workshop in Smyrna of the marble technician Nikolaos Perakis from Tinos, since it has all the stylistic features of his work. 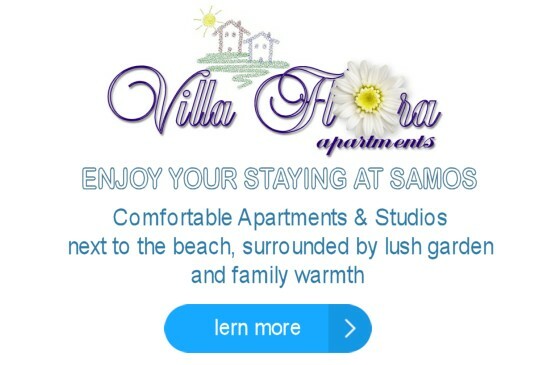 Initially, the bell tower had 8 big bells from Russia, of which 6 are left, but the sound remains sweet and loud, so loud that it sounds to Karlovasi and the other villages, so the other villages of Samos “gave” the nickname to the inhabitants of Lekka “Campanaride” (those with the big bells). 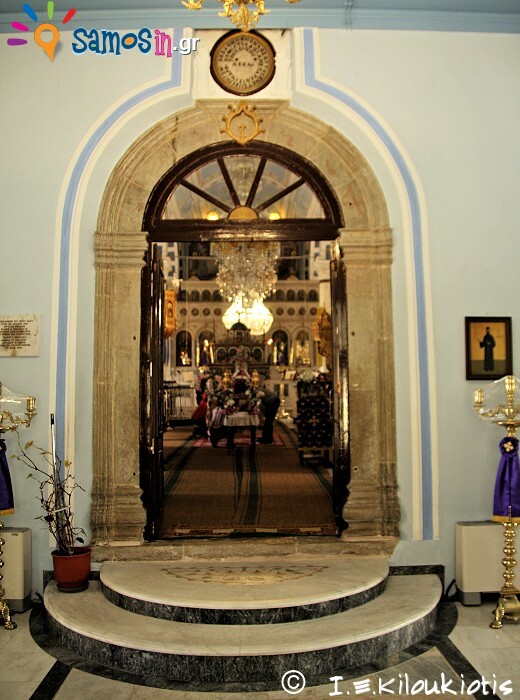 The interior of the church is richly decorated, with a nice marble, well-worked iconostassis, which is made in 1914, at the marble sculpture workshop in Smyrna by the artist N. Perakis from Tinos island . 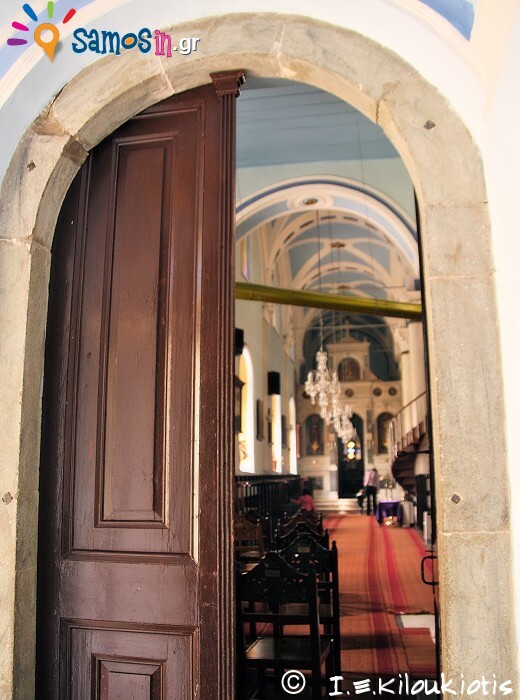 The old wooden iconostassis of the church was a work of 1871 of the traditional woodcutter from the region, known as “Mastrosophocles”, which was replaced at the beginning of the 20th century and was transferred (till to date) to the chapel of Agios Nikolaos of Lekka village, except the iconostassis doors, which adorn the newest marble iconostassis of the church. The two rows of columns that support the roof are internally composed of trunks of cypress with exterior coating to give the impression of a marble pillar. The roof of the church is made of woodwork, externally plastered, with excellent plaster decorative frames and some paintings. 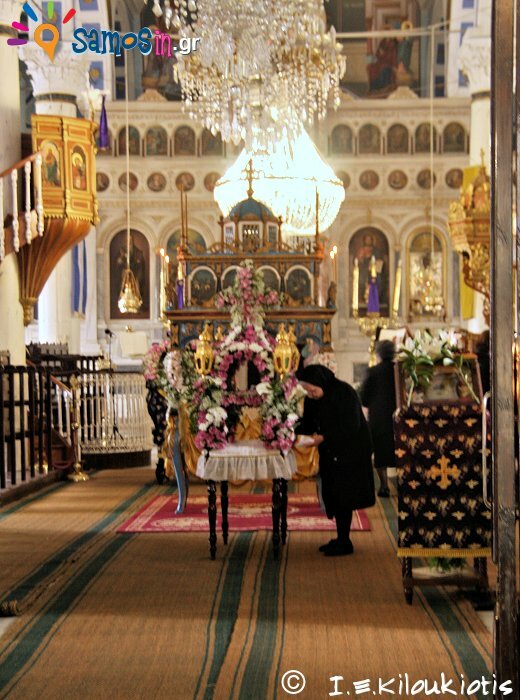 The collection of the icons of the church is rich, since it includes all the icons of the dependent chapels (transported to the chapels when they are celebrated), but also many tributes made by the residents and emigrants of the village, but the most important of all is the piece from “Agia Kara” (saint’s skull) of Saint John the Baptist, who had been supplied by village residents from the Holy Land and exchanged it with “tons of olive oil “. The wood-carved Despotic throne was built in 1811 and the exceptional art of epitaph in the 19th century. 47 printed books from 1749 to 1900 are preserved in the church library, mainly functional and musical books. One of them, of 1882, by deacon Athanasios, contains the church order at national and royal celebrations, a rare book for bibliography. 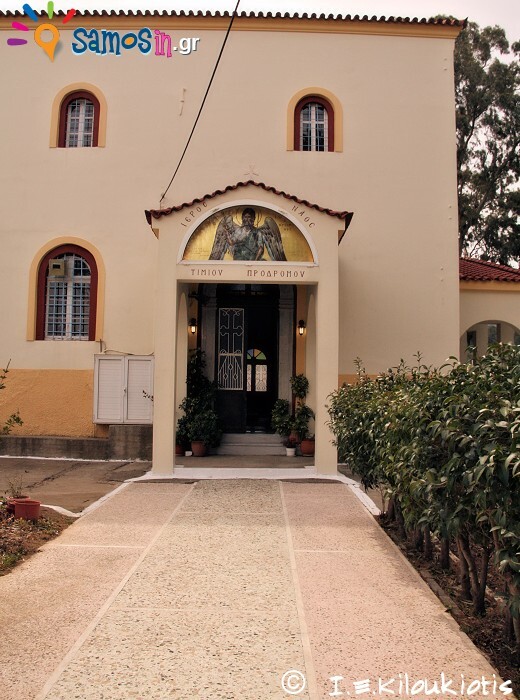 The Church of Agios Ioannis Prodromos (Saint John the Baptist) is the pride and the reference point for every resident of Lekka village, either staying at the village or away from it, so when they refer to the church name, always accompanied by a possessive pronoun “our Ai Jiannis” (our saint John). 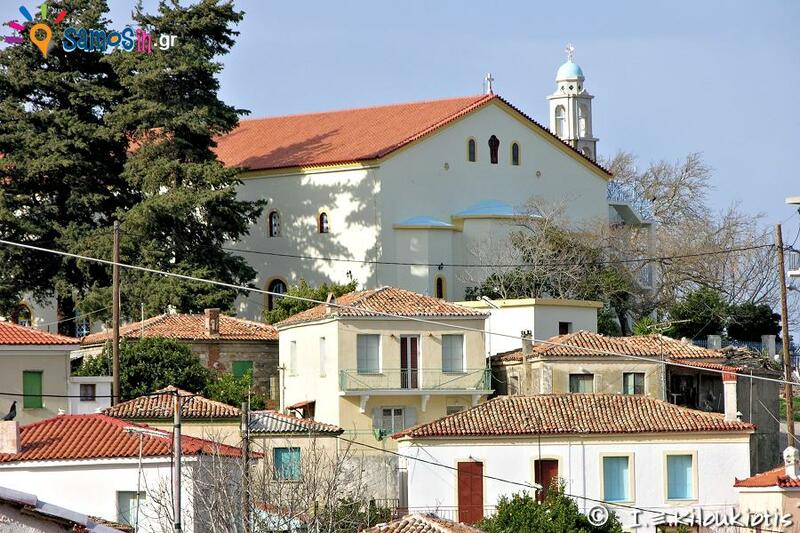 The church located at the top of the hill of the Lekka village. Access is easy either from the village square on foot, or by car following the road to the village Kastania and turning east (left), after 450 m from the village parking.